Google Places is one of the most impactful services that Google has released in making wholesale changes to the layout of their page – ever! Google estimates that 20% of all visits are local in nature. They have responded by launching a robust mapping tool which allows business owners to add their own business information. All in the name of giving Google users a better search experience. Google Places allows business to maintain and develop an online gateway by providing company information, hours, service/product categories, reviews, photos & video. How does Google Places work? The Google page is now experiencing complete convergence. A new term has been developed due to the rise of Google Places called ‘Blended Results’. Organic Optimization, Google Places and Paid Search have become very interrelated. 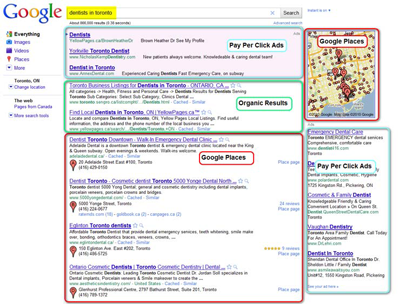 A strong SEO & Places Optimization campaign allows ‘blended’ results to appear more frequently. Google Places maps can show within a Paid Search ad. Paid Search ads can appear within Google Places/Maps.